Take I-25 North to Lafayette/Route 7 (Exit #229). Follow Route 7 (which turns into Baseline Road) all the way to Route 287. Turn right at fourth light onto Rte. 287 (north). Follow Rte. 287 for approximately five miles (crossing Arapahoe and Isabelle Roads). Entrance to school is on the left. Follow signs to Henderson Hall at top of hill. Entrance to school is on the right. Follow signs to Henderson Hall at top of hill. Turn east on Arapahoe and follow to Rte. 287 (approximately nine miles). Take left on Rte. 287 and follow approximately three miles. Entrance to school is on the left (Dawson Drive). Alexander Dawson School is located at 10455 Dawson Drive, Lafayette CO 80026. It is located directly on the west side of Highway 287. From the west, take Dartmouth east from Sheridan Blvd. to Raleigh Street, head south on Raleigh Street to the park. From the east, take Dartmouth west from S. Lowell Blvd. to Raleigh Street, Head south on Raleigh Street to the park. Slater Field (Turf): Slater Field is located directly across Pierce from the main CA Campus. The campus is on the East side of Pierce and Slater field is on the West. Parking is on the South end of the field and is accessible from Pierce, via a drive on the west side of the street about 200yards south of the Main CA entrance. TURF FIELD: From the north: Take I-25 south to exit 184 (Meadows Pkwy). Turn right (west) and go about 3/4 mile to Meadows Blvd. Turn right on Meadows Blvd. Go about 1/2 mile to North Meadows Drive ( Castle Rock Middle School is on your right). Turn right on North Meadows Drive. The high school is about 1/4 mile on your right. Turf field is straight ahead. Please park in the parking lot behind the baseball field. Do not park in the bus lane they will ticket you! GRASS FIELD: From the north: Take I-25 south to exit 184 (Meadows Pkwy). Turn right (west) and go about 3/4 mile to Meadows Blvd. Turn right on Meadows Blvd. Go about 1/2 mile the Castle Rock Middle School will be on your right. Park in the front parking lot of the Middle School for grass field games. The grass field is on top of the hill, south west of the parking lot. Please do not park in the bus lane they will ticket you! From the north: Take I-25 south to exit 184 (Meadows Pkwy). Turn right (west) and go about 3/4 mile to Meadows Blvd. Turn right on Meadows Blvd. Go about 1/2 mile to North Meadows Drive ( Castle Rock Middle School is on your right). "the grass field" East of the CRMS parking lot. Take I-25 to exit 143. Turn east (away from mountains) on Uintah Street, and proceed up the hill about a quarter mile to Cascade Avenue. Turn right (south) on Cascade to Cache La Poudre. Turn right (west) on Cache La Poudre and down the hill to the El Pomar Sports Center, third and final building on the right. Parking is on the street and very limited near the facility. Additional parking is available on Dale Street just to the south, or in the Monument Valley Park lot across the creek to the west. Access Washburn Field by walking north, past the El Pomar Sports Center on either side. The field is located to the S/E of the main turf stadium, closest to Cresta Rd. 0.8 mi, School is on the right. Take I-25 South to Pueblo, take exit 101 (stay in the left lane) onto Colo HWY 47 and go East to the Bonforte Blvd exit, turn left on Bonforte Blvd towards the CSU-P campus. Take a right on Bartley Blvd, follow Bartley all the way around past Massari Arena to Fowler Ln. Turn right at Fowler Ln and go through the parking lot to the field. Landmarks by the field; just West of the big water tower or behind the CSU-P Child Care Center. Take I-25 south to Pueblo, take exit 101 (stay in the left lanes) to CO 47, take CO 47 east to Troy Ave, go left on Troy to Rawlings Blvd, go left on Rawlings Blvd to the field. The NEW lacrosse facility is on the left, parking is on the right (North). David A. Lorenz Regional Park is located on the East side of Colorado Blvd just south of County Line Road at 8422 S. Colorado Blvd. Coming from the West: From C-470, exit University Blvd and go north about one block. Turn right or East on County Line. Take County Line about one mile to Colorado Blvd and turn right or south. Enter by the 7-11. Coming from the East: From C-470, exit Quebec and go north about one block. Turn left or West on County Line Road. Take County Line about one mile to Colorado Blvd and turn left or south. Enter by the 7-11. DRIVING DIRECTIONS COMING FROM THE NORTH• If you are traveling South on Interstate 25, exit East or left onto Thornton Parkway. Proceed East on Thornton Parkway and turn South or right onto Colorado Boulevard. Continue South on Colorado Boulevard and turn East or left onto 88th Avenue. Continue East on 88th Avenue (you will cross over Interstate 76 and pass the Mile High Flea Market) and then turn South or right on to Highway 2. Continue South on Highway 2 and turn South or left onto Quebec Parkway. Then turn East or left onto Prairie Parkway (64th Avenue) and into event parking. • If you are traveling West on Interstate 76, exit South onto US Highway 6 & 85. Continue South on US Highway 6 & 85 and turn left or East onto 72nd Avenue. Continue East on 72nd Avenue and turn right or South onto Quebec Parkway. Continue South on Quebec Parkway and turn East or left onto Prairie Parkway (64th Avenue) and into event parking. • If you are traveling East on Interstate 270 & South on US Highway 36, Exit South onto Vasquez Boulevard and immediately turn left or East onto 56th Avenue. Continue East on 56th Avenue and turn left or North onto Valentia Street and into event parking. • If you are traveling West on Interstate 70, exit North onto Havana Street. Proceed North on Havana Street. Turn West or left at 56th Avenue. Turn North or right on Valentia Street and into event parking. • If you are traveling North on Interstate 25, exit East onto Interstate 70. Continue traveling East on Interstate 70, exit North onto Quebec Street. Proceed North on Quebec Street. Turn East or right 60th Avenue and into event parking. • If you are traveling North on Interstate 225, exit West onto Interstate 70. Proceed West on Interstate 70 and exit North onto Havana Street. Proceed North on Havana Street. Turn West or left at 56th Avenue. Turn North or right onto Valentia Street and into event parking. • If you are traveling East on Interstate 70, exit North onto Quebec Street. Proceed North on Quebec Street. Turn East or right 60th Avenue and into event parking. • If you are traveling South on Interstate 25, exit East or left onto Thornton Parkway. Proceed East on Thornton Parkway and turn South or right onto Colorado Boulevard. Continue South on Colorado Boulevard and turn East or left onto 88th Avenue. Continue East on 88th Avenue (you will cross over Interstate 76 and pass the Mile High Flea Market) and then turn South or right on to Highway 2. Continue South on Highway 2 and turn South or left onto Quebec Parkway. Then turn East or left onto Prairie Parkway (64th Avenue) and into event parking. Drive east on Baseline Road. Turn right (head south) on 55th St. Follow 55th St to the East Boulder Rec Center. East Boulder Rec West Grass field is located west of the turf fields. This field is used for 7v7 games. C-470 to Bowles, exit and turn east (Right) to 1st light (Coalmine Rd). Turn right, the fields will be on the left hand side past Dakota Ridge H.S. From I-25 exit east on S. Circle Drive/CO 29 (Exit 138). Continue to follow S. Circle and turn right onto Janitell Road E. Turn left onto Executive Circle. End at 2212 Executive Circle. Field A is a grass field located at the very north end of the park. From I-25, take Harmony Rd exit 265. Go west to Timberline (3 miles). North on Timberline to Caribou (first light). Go east, road curves back to the north. Park is on north side of Linton Elementary. Park in school or on street. Between McIntyre and Easley Road SOUTH of 54th Ave. Directions: Take C-470 to Kipling St. and turn North. Go to the first light (Remington Place) at turn East (Right). Go to Garrison Street and turn South (Right). The school sits one block up on the right hand side of the street. 1. From I-25 exit 148, east (left) south on Corporate Dr (.2 miles) to Nevada Ave (Corporate Dr heads south and becomes Nevada Ave). 2. Continue south on Nevada Ave (.5 miles) to Four Diamonds Sports Complex. 3. Four Diamonds Sports Complex is on the east side. 1. From I-25 exit 146, east on Garden of the Gods Rd (.7 miles) to Nevada Ave.
2. North (left) on Nevada Ave (.5 miles) to Four Diamonds Sports Complex. Go north or South to exit 156 and go east 1.7 miles to Old North Gate Rd. turn left for 1.1 miles to Roller Coaster Rd. Turn Left and proceed 1.5 miles to Stella. Turn left the field is .4 miles on the right. I-25 to exit 265 Harmony Rd, west to Corbett Dr, south 1/4 mile to Harvest Park Ln. then west to the end of the street. Park is on the north side OR you can park at Traut Elementary at the North side of the park. Directions: Santa Fe to Oxford Ave. East on Oxford to Jason St. (3 blocks). South (right) on Jason to the park (2 blocks). Park and parking lot on your right. Happy Canyon Road and S. Ivy Way. Go west on Hampden from I-25. Go left on S. Holly, 1st stoplight. Go past TJ High School and turn left on Happy Canyon Rd. Take first left past the park on S. Ivy Way. 1. North on I-25 to I-80 (exit 8B towards Laramie). 2. West on I-80 (42.6 miles) to exit 316 (Grand Ave/US-30 exit). 3. Northwest/west (right) on US-30 (2 miles) to 30th St.
4. North (right) on 30th St (.5 miles) to Armory Rd. 5. 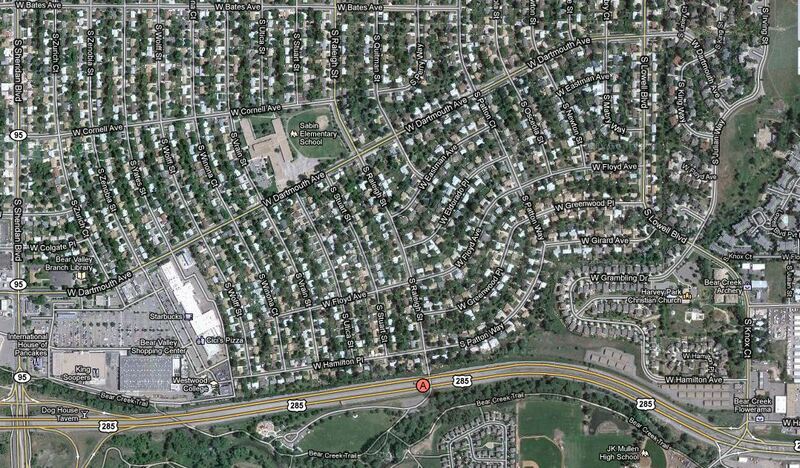 West (left) on Armory Rd (couple blocks) to Laramie Park. 6. Laramie Park is on the north side. I-25 north, west on Hwy 34. South on Boyd Lake Rd approx. 1/4 mile south of Hwy 34. Turn east into sports park. turf field is on the east end of the park with the light poles around it. 1. From I-25 exit 196, west on Dry Creek Rd (2.5 miles) to Holly St.
2. North (right) Holly St (.6 miles) to Easter Ave.
3. West (left) on Easter Ave (.3 miles) to Medema Park. 4. Medema Park is on the south side. 2. North (left) on University Blvd (1.2 miles) to Dry Creek Rd. 3. East (right) on Dry Creek Rd (1 mile) toColorado Blvd. 4. North (left) on Colorado Blvd (.5 miles) to Easter Ave.
5. East (right) on Easter Ave (.6 miles) to Medema Park. 6. Medema Park is on the south side. Take I-25 south to exit 94 (N. Pueblo Blvd), stay on Pueblo Blvd in the R lane for four blocks and turn R on Gretna Ave, the fields are on the left. For additional parking follow Reno Ave to Palmer, turn L on Palmer and then take the first L that goes through a paved parking lot to a gravel parking lot. All parking is on the east side of the lacrosse fields, there is no parking on all the other sides of the fields. Take the COUNTY LINE RD exit, EXIT 163, toward PALMER LAKE. Turn LEFT onto COUNTY LINE RD/PALMER DIVIDE RD. Turn RIGHT onto MONUMENT HILL RD. Merge onto I-25 N toward DENVER. Take the CO-105 exit, EXIT 161, toward MONUMENT/PALMER LAKE. Turn RIGHT onto WOODMOOR DR. Turn LEFT onto MONUMENT HILL RD. From S. Broadway and Highlands Ranch Parkway, go west on Highlands Ranch Parkway. Turn left on Westridge Village parkway. Fields are on the right side of the street. Please park in designated parking lot. Qail Creek park is located at 2300 W. 138th Ave. just to the North of King Supers on 136th and Zuni. Exit I-25 at 136th Street and follow west. Turn right at Zuni and go 1 block north and take your first right, on to W. 138th Ave. You should see the park off to the right, a baseball/softball field is visable from Zuni. Exit 36 at Broomfield 120th/ US 287(Westbound) or Rocky Mountain Airport (Eastbound). Take 287 north to the 120th Street Exit (Left Exit). Take 120th to Sheridan Ave. Go north (left) on Sheridan Ave to 136th Street. Go east (right) on 136th St. to Zuni. Turn left at Zuni and go 1 block north to W 138th Ave and take a right. You should see the park off to the right, a baseball/softball field is visable from Zuni. From eastbound I-70 exit 259 (Golden exit), north (left) on Colfax Ave (1.8 miles) to Rooney Rd. OR From westbound I-70 exit 262, west (right) on Colfax Ave (1.6 miles) to Rooney Rd. South on Rooney Rd (.4 miles) to entrance to park. Entrance to the park is on the west (right) side of road. Once you turn onto this unnamed road, there is a sign that says RooneyRoad Recycling Center. Follow this road (.2 miles) to Rooney Road Sports Complex. From I-25 exit 194, west on C-470 (20 miles) to Hampden Ave/US-285 North. From I-70 exit 260, south on C-470 (5 miles) to Hampden Ave/US-285 North. 1. From C-470 (Denver exit), east on Hampden Ave/US-285 North (3 miles) to Kipling St.
2. South (right) on Kipling St to Dan Schaefer Athletic Complex. 3. Dan Schaefer Athletic Complex is located at the SE corner of Hampden Ave & Kipling St.
From I-25 and US 36 - Take Northwest Parkway West to Sheridan Blvd. Exit Sheridan Blvd and turn left (south). Field will be approx. 1 mile on your right. Directions from I-25 and US-36: Take Northwest Parkway(East from US-36/West from I-25) to Sheridan Blvd Exit. Turn south on Sheridan Blvd. Park is about a Mile southwest on the right. Make your way to the intersection of W. Ohio Ave & S. Sheridan Blvd. To do so, from the North, use US 6, south on Sheridan Blvd. to W. Ohio Ave.
From the South, use US 285 (Hampden Ave) head north on S. Sheridan Blvd, to W. Ohio Ave. Turn west on Ohio Ave. head west two blocks from Sheridan you will see the fields on the left. Use the Parking lots found at the Brady Exploration School located at the intersection of S. Sheridan Blvd and W. Ohio. Please do not park at the "Center of Hope Rehab" or the Church Parking lots located on W. Kentucky Ave.
Stagecoach Park is located on the NE corner of Hwy 74 (Evergreen Pkwy) and Stagecoach Blvd. From Denver, turn left onto Stagecoach, and immediately left onto El Pinal Drive. parking lot on Syracuse St.
I-25 to exit 265 Harmony Rd, west to Lemay Avenue, north 3/4 mile. The park is on the west side of the street. ADDITIONAL Parking is on the West side of the entire park just South of the Baseball diamond. Go West of Horsetooth Rd to the next light to enter this parking lot. Grass field just north of Windsor High School turf stadium.